Bali is full of magical spots, and it would certainly be a bit difficult to cover all the special places it boasts of. The island paradise lures all kind of tourists and travelers. It could be a spiritual center for some, and for others this gorgeous island would be a means for immersion in Indonesian culture. A holiday in Bali could just go on and on, and those wonderful memories will stay in your heart for years to come. The main areas that most tourists like to cover are Ubud, South Kuta, Nusa Dua and Kuta. They are filled with spas, luxury Bali villas and romantic spots that are simply not to be missed. Depending on what time you arrive in Bali, you would, of course, like to rest and rejuvenate before setting out. We propose a 5-day itinerary to get the most out of the awesome island and for a relaxing vacation. The day after your arrival, it is time to head for Ubud. You can easily find a number of great, cheap places to stay here. Ubud is a very calm and relaxed location, and if you are not too tired, you can get ready to explore. You could join a yoga or a cooking class, depending on your mood. 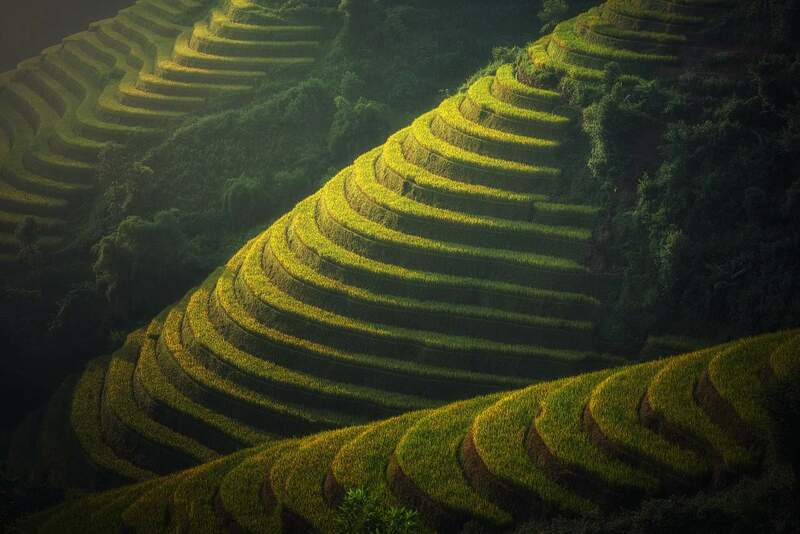 Or, you could go hiking in the rice fields, after having some banana pancakes. Take advantage of the many free hikes through the rice fields in Ubud. Do buy some fresh coconut from the locals. Ubud Palace is located in the center of Ubud, and most of the compound with statues and stone carvings is open to the public. Later you can head to the Monkey Forest. After all that hiking, you will probably be a little bit tired. Get a relaxing massage at The Lokha Ubud that will leave you completely refreshed. In the evening, it is time to walk through the Ubud Market Place and have a look at the local handicrafts and souvenirs. You’ll have to choose one of the options, Bird Park or Zoo Park, as it is impossible to explore both places in the same day. This is because they are quite huge and exhausting. Explore the Bird Park with thousands of birds and hundreds of species. The very well managed Bird Park is a must-see attraction in Bali and is unique in itself. Birds live in their recreated habitats complete with indigenous plant life. Embark on a magical journey across Latin America, Africa, the Indonesian archipelago and Australia. You can take a bread for refreshing tropical juices and enjoy local and international dishes at the open-air restaurants. Bali Zoo Park boasts of amazing animals and is a major tourist attraction. Do not miss the chance to see those amazing animals. They offer a great wildlife experience for your children as they participate in animal feeding and animal shows. Hundreds of monkeys dwell in Ubud Monkey forest. After an interesting and adventurous day with nature, birds, and wildlife, spend the night at a local resort. Spend your first day in Kuta exploring a region that has plenty to do and see. For example, shop for beautiful and modern ceramics at Jenggala and enjoy a great dinner at Jimbaran Beach. During the day, visit the famous temple Pura Uluwatu. If you are an avid golfer, you can head for the New Kuta championship golf course, which is one of the most challenging in Asia. Enjoy spectacular views from the park set amidst limestone cliffs looking down on the Indian Ocean. You will come across low-key hawkers selling soft drinks, beer, and snacks. Just rent out surfboards, lounge chairs and umbrellas to enjoy your drinks and snacks. You can spend the night at South Kuta but make sure you do not miss the sunset. You can find some wonderful places to eat and drink at night at the local restaurants that serve some of the best grilled seafood. It is also a fun experience to explore the local fish market. After resting and recovering, head to the beach for some surfing lessons. Kuta is also known for great surfing, and this is the only way to enjoy the true surfing culture in Bali. There are several surf spots that are just perfect for the beginners and professionals. Kuta’s sister beaches offer the right spots to improve your wave riding. Head to Seminyak and hit one of the posh beach bars when the sun goes down. Enjoy fine live music, hookahs, and bean bags, or set a lantern into the night sky. You can enjoy some super and awesome massage after exploring the main areas of Kuta. If you still have most of the day, go to Waterbom Bali in Kuta. For families with kids this is a must-do as children will love this family-friendly attraction. Enjoy a full wet day with your family in the island’s premier water park. There are exciting slides, tropical gardens, and pools, water games, plus lots of dining and leisure facilities. If in a mood for some shopping, head to Discovery Shopping Mall in south Kuta nearby. The five-day itinerary makes for an excellent balance of exploring, fun filled activities and adventure along with cheap eats and fantastic shopping time. For more Indonesia trip ideas, have a look here!